I see sea-Chanels by the seashore. Gatsby would have gasped, seeing Daisy in such a delightful ensemble. Mademoiselle Chanel would also have been pleased with Monsieur Lagerfeld’s Resort 2010 collection. After all, she fell in love with the sea – and the striped shirts of sailors – on her visits to Deauville, in the Basse-Normandie region of France. It was a place she visited often with lover, Arthur “Boy” Capel. 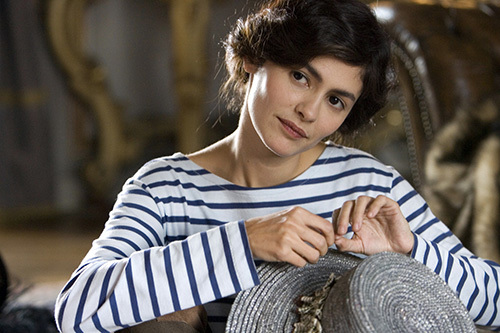 If you haven’t seen Coco Avant Chanel, you must. Audrey Tatou becomes Coco and director Anne Fontaine’s subtle use of Chanel’s aesthetic in the art direction and visual vocabulary of the film left me with a rich view into Chanel’s world. See more of the 2010 Resort Collection in Red or Dead, Resorting to the LBD and Flappergasted.